Dengue viral infections are one of the most important mosquito borne viral infections in the world, infecting approximately 390 million individuals a year. Therefore, carrying out relevant and cutting edge research this area in order to come up with a long lasting solution, is the most urgent priority at this hour. 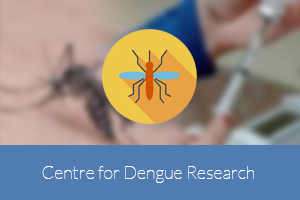 To conduct high quality, with high scientific standard, to find long lasting solutions to reduce the morbidity and mortality associated with dengue. Jeewandara, C., Gomes, L., Udari, S., Paranavitane, S.A., Shyamali, N.L.A., Ogg, G. S. and Malavige, G. N. Secretory Phospholipase A2 in acute dengue infection. 2016. Kamaladasa A, Gomes L, Jeewandara C, Shyamali NL, Ogg GS, Malavige GN. Lipopolysaccharide acts synergistically with the dengue virus to induce monocyte production of platelet activating factor and other inflammatory mediators. Antiviral Res. 2016 Jul 28;133:183-190. Fernando S, Wijewickrama A, Gomes L, Punchihewa CT, Madusanka SD, Dissanayake H, Jeewandara C, Peiris H, Ogg GS, Malavige GN. Patterns and causes of liver involvement in acute dengue infection. BMC Infect Dis.2016 Jul 8;16:319. Jeewandara, C., Gomes, L., Udari, S., Paranavitane, S.A., Shyamali, N.L.A., Ogg, G. S. and Malavige, G. N. Secretory Phospholipase A2 in acute dengue infection. Infection, Immunity and Inflammation. 2017. Impact factor: Journal launched 1 year ago. Minimisation study of dengue prognostic biomarker panel test: 17th International Congress on Infectious Diseases, 2016, Hyderabad. Factors leading to liver injury in acute dengue infection: 17th International Congress on Infectious Diseases, 2016, Hyderabad. Obesity and the presence of asthma are associated with hospitalization due to dengue infection. 17th International Congress on Infectious Diseases, 2016, Hyderabad. Viral aetiologies of acute encephalitis in a hospital-based population in Sri Lanka: 17th International Congress on Infectious Diseases, 2016, Hyderabad. Expansion of regulatory T cells in acute dengue infection does not associate with disease severity: 17th International Congress on Infectious Diseases, 2016, Hyderabad. Dengue: Mathematical modelling of cytokine levels in the evolution of severity: 17th International Congress on Infectious Diseases, 2016, Hyderabad.